Newton Press has come a long way since it was established in 1963 in Newton Aycliffe, County Durham by Syd Howarth. Print and design was not what it is today, and the firm has evolved over the last 55 years, but one thing has stayed the same – and that is Syd Howarth himself. The print veteran, who was awarded an MBE for his contribution to the community, celebrated his 80th birthday in October 2017, and before Syd decided to embark on his adventure in print, he had served his apprenticeship in Nottingham, followed by National Service, before moving north to work in Newcastle and the Morpeth Herald. Whilst Syd’s three sons mostly take care of Newton Press, he still has an active role within the company, and is honorary editor of ‘Newton News’. Stuart Howarth, Syd’s son, says: “He came out to set up as a printer/bookbinder originally, and then the business quickly evolved into the town’s printer. 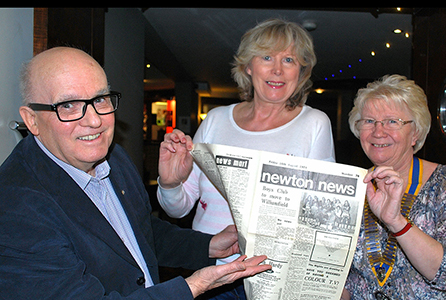 The Newtonian was a monthly newsletter which Syd took over and created Newton Aycliffe’s own local community newspaper – now the Newton News – which has run since the late 40’s. The new town was in its infancy and Newton News claims to be the first “Free” weekly newspaper financed entirely from advertising revenue and delivered to each home in the town. The business began with hand composition and melting hot lead. The firm started with a Heidelberg Platen and moved to Litho printing with a Kord. Stuart continues: “I think I came into the business not long after we moved into litho, hot lead went and we progressed to computer origination. We still have a letterpress machine here used for cut out, creasing and perforation. My dad was actually the first one to bring a computer into the business, and we were saying, ‘really? what the hell do you want one of them for?’. Syd is still very much involved at Newton Press, and still actively chips in with solutions and ideas for the company. On Syd’s MBE, Stuart says that it was not easy to get his father to accept such a prestigious award. He explains that his dad was nominated twice before, but did not accept it. Stuart explains: “It took us about six or seven weeks to talk him into taking it. He got it for his service to the community. He turns up to absolutely everything – people don’t go to Citizen’s Advice, they go to Syd. He just sorts it, and that’s the kind of guy he is. Syd says: “The award was given for my work in the community so it was right to have it presented here in the presence of my family and friends. Find out more about Newton News and read the latest from the team via their website.